Will Tunisia Transition from Tyranny into Democratic Despotism? Part 1: Are We Witnessing the Start of a Global Revolution? It has been a month since President and dictator Zine El Abidine Ben Ali fled Tunisia, sparking the civil disobedience and protests that have since resulted in the fall of one of the Arab world’s strongest and most long-lasting dictators, Hosni Mubarak. Yet, where does Tunisia stand today, and where is it headed in the future? In Part 1 of this series, I asked the question, “Are we witnessing the start of a global revolution?” I concluded that we are seeing the emergence of a powerful phase in what will be a long road to world revolution, spurred on largely by what is referred to as the ‘Global Political Awakening.’ The ‘Awakening’ is driven by the information and communications revolutions, in which people around the world, and in particular in the ‘Third World’ have become increasingly aware of their lack of freedom, economic exploitation, oppression and disrespect. Specifically, the educated youth are the driving force, and the quest for human dignity is the driving impetus. In Part 2 of this series, I analyzed how American imperial strategy has changed in the past several years to support democratization in the Arab world, not out of any humanitarian qualms regarding supporting oppressive and ruthless tyrants, but out of strategic interest in securing long-term control and hegemony over the region. The strategy of “democratization” is a method of controlling and managing the process and problems inherent in the Global Political Awakening. However, American strategists and think tanks made it clear that they preferred a strategy of democratization supporting “evolution, not revolution.” Thus, when the uprisings and revolutions began, America’s imperial strategists were quick to react in order to attempt to control the situation. The aim, then, is to mitigate and manage the process of change, promoting the idea of “unity” or “transition governments,” so that America may manage the transition into a democratic system that is safe for Western interests, and will produce a political elite subservient to America and Western financial institutions like the World Bank and IMF. This part of the series, “North Africa and the Global Political Awakening,” is a brief examination of the strategy undertaken in Tunisia to pre-empt and subsequently manage the uprising that took place, and where this could likely lead. According to the Wikileaks diplomatic cables on Tunisia, the issue of succession in Tunisia from the Ben Ali regime were being discussed by the American Embassy in 2006. However, at the time, the Ambassador noted that, “none of the options suggest Tunisia will become more democratic, but the US-Tunisian bilateral relationship is likely to remain unaffected by the departure of Ben Ali.” It was discussed that if the President became “temporarily incapacitated” (largely referring to his struggle with cancer), then “he could turn over a measure of presidential authority to Prime Minister Mohammed Ghannouchi.” The Ambassador noted that average Tunisians generally view Ghannouchi “with respect and he is well-liked in comparison to other GOT [Government of Tunisia]” and party officials. Ghannouchi was subsequently the person who stepped in as interim President once Ben Ali fled in 2011, but with very little support among the people, who demanded he resign as well. Many U.S. democracy promotion organizations had established ties to Tunisian civil society organizations and opposition leaders over the past few years, including the National Endowment for Democracy (NED), Freedom House, and the National Democratic Institute (NDI). Within days, the formation of a unity government was announced, vowing “to work towards democracy,” which resulted in several opposition leaders joining: “Ahmed Ibrahim, head of the Ettajdid party, Najib Chebbi, founder of the opposition PDP party, and Mustafa Ben Jaafar, head of the Union of Freedom and Labour, are all expected to get senior appointments.” Ibrahim was quoted as saying, “The main thing for us right now is to stop all this disorder. We are in agreement on several principles concerning the new government.” Najib Chebbi, leader of the opposition PDP party and member of the “unity government,” is a lawyer who “has long been seen by Western diplomats as the most credible figure in the opposition.” The “unity government” announced that it planned to hold elections within 6 months. In other words, American officials are deeply involved in attempting to legitimize the Tunisian “unity government,” in order to hold elections in six months, when the U.S. can ensure that they control the outcome. Thus, the U.S. is interested in holding back the revolution, likely pressuring General Ammar to try to reason with the protesters, as well as support the unity government itself. As US envoy Feltman stated, “What’s going to give any government real credibility… are elections,” and that, “To get to credible elections after having a system that so restricted the role of civil society and political parties… is going to take some time and effort.” In other words, America is attempting to stem the ‘revolution’ and maintain and manage the ‘evolution’ into a democratic government which they would ultimately control, just as suggested by the CFR Task Force Report. As one Tunisian protester proclaimed, “Somebody is stealing our revolution.” Feltman’s acknowledging of the need to build a more effective civil society before the elections provides support for the revelations in the diplomatic cables that the Tunisian government of Ben Ali was severely hampering American efforts to foster Tunisian civil society groups. Thus, I don’t think it is appropriate to see the Tunisian uprising as “engineered in America,” since America was ultimately caught unprepared. The west should also openly pressure other authoritarian regimes to liberalise, acting as a midwife for democratic reform. In countries in which Islamist movements are better organised than liberal ones, the west should focus on developing moderate civil society groups, parties and institutions rather than calling for snap elections. Most importantly, our distribution of foreign aid should reflect and advance these priorities. 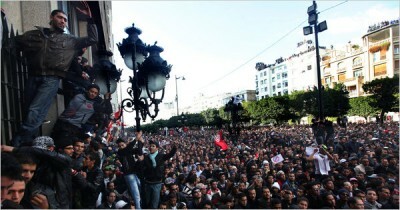 Regimes and reformers throughout the region are taking note of events in Tunisia. The US and Europe must act quickly. So what ae these “democracy promotion” organizations? Three prominent ones are Freedom House, the National Democratic Institute and the National Endowment for Democracy. One of the previous chairmen of Freedom House was R. James Woolsey, former Director of the CIA. The current chairman is William H. Taft IV, former U.S. Deputy Secretary of Defense, former U.S. Ambassador to NATO, and former chief legal adviser to the State Department. Member of the Board of Trustees of Freedom House include individuals past or presently associated with: the U.S. Department of State, the Council on Foreign Relations, Citigroup, Warburg Pincus, AFL-CIO, Morgan Stanley, the Brookings Institution, Visa, USAID, and the Associated Press. The Chairman of the board of the National Democratic Institute (NDI) is Madeleine Albright. Another notable member of the board is James Wolfensohn, former President of the World Bank, and former member of the board of directors of the Rockefeller Foundation and the Population Council. The National Endowment for Democracy (NED), was founded by Ronald Reagan in 1983 with the aim of “promoting democracy,” registered as a private organization, nearly all its funding comes from the U.S. Congress. One of the founders of the NED, Allen Weinstein, once stated that, “A lot of what we [the NED] do today was done covertly 25 years ago by the CIA.” Notable members of the board include Kenneth Duberstein, CEO of the Duberstein Group, and member of the boards of Boeing, Fannie Mae, and the Council on Foreign Relations; Francis Fukuyama, author of “The End of History”; William Galston, senior fellow at the Brookings Institution; Zalmay Khalilzad, Counselor at the Center for Strategic and International Studies (CSIS), former U.S. Ambassador to Iraq, Afghanistan, the United Nations, and former Defense Department official; Larry A. Liebenow, former Chairman of the U.S. Chamber of Commerce, and has served on the board of the Council of the Americas (founded by David Rockefeller, who remains as Honorary Chairman); Ambassador Princeton Lyman, senior fellow at the Council on Foreign Relations, former Deputy Assistant Secretary of State for Africa, former Ambassador to Nigeria, former Ambassador to South Africa, former director of USAID; Moisés Naím, senior associate at the Carnegie Endowment for International Peace, former director of the Central Bank of Venezuela, former executive director of the World Bank, and is a member of the boards of Population Action International and the International Crisis Group; and Vin Weber, on the board of the Council on Foreign Relations, and co-chair with Madeleine Albright on the CFR Task Force Report on reform in the Arab world. One month after Ben Ali’s departure, Tunisians are left with more political freedoms, yet there is still grave concern over the path of change taking place, “with Tunisia’s old guard still strong and interim authorities often overwhelmed — many said they fear promised changes may be swept aside.” One opposition group leader in Tunisia has stated that, “There is no clear political will to break from the past. The government’s decisions have come with delays that have damaged its legitimacy and provoked a crisis of confidence.” Thus, “some fear the revolution will be confiscated, its potential wasted behind a smokescreen of reforms.” Yet one thing has clearly changed in Tunisia, the development of a feeling and taste for freedom. Once that wondrous inherently human taste for freedom is felt, it is incredibly difficult to suppress, and becomes far less tolerant of any methods aimed at control. This is both a very hopeful and deeply precarious situation. Change always is. The real question is whether or not this ‘transition’ will bring about true freedom and true democracy, or if it will retain “neoliberal freedom and democracy”, which amounts to a kind of democratic despotism, in which democracy becomes simply about voting between rival factions of elites who all serve the same foreign imperial interests. Could Tunisia potentially witness a populist democracy, like those that have spread across Latin America? Or will it succumb to the American brand of democracy? Time, it seems, will only be able to answer that question. As always, the odds are against the people, but again, as events over the past 30 days have shown the world, the people can always defy the odds. Andrew Gavin Marshall is a Research Associate with the Centre for Research on Globalization (CRG). He is co-editor, with Michel Chossudovsky, of the recent book, “The Global Economic Crisis: The Great Depression of the XXI Century,” available to order at Globalresearch.ca. He is currently working on a forthcoming book on ‘Global Government’.